List of Contractors (Civil), NDMC Category wise Circular - Booking of Unauthorized Constructions such as Demolition, Sealing, Prosecution proceedings etc, Bye-Laws for Management of Solid Waste RFP/Tender Document for the work of Setting up of Engineered Landfill Site for South Delhi Municipal Corporation at Tehkhand, Okhla RFP document for Appointment of Consultant to Carry Out Consultancy Services for Establishment of Plastic Waste and E-Waste Management System in SDMC NIT No. D/EE (Engg Store)/2017-18/355 Guidelines, rules & regulations of Community Halls of SDMC. RFP for Supply of printed ID cards for SDMC emplyees CIRCULAR - Regarding e-tendering contractual amount for the quoted rate up to two decimals only Representation of Municipal Employees for transfer & posting ADDENDUM-IV NIT No. F.120/E-in-C/SDMC/2017/13 dated 7.7.2017. Name of Work : Integrated Collection & Transportation of Municipal Solid Waste and Street Sweeping Waste in Najafgarh Zone. Corrigendum-Date and Time of submission of Bids w.r.t Supply, Installation & AMC of DLP 70” Video Wall LED Screens vide SDMC/IT/2017-18/03 has been extended till 28.08.2017 at 03:00 PM. 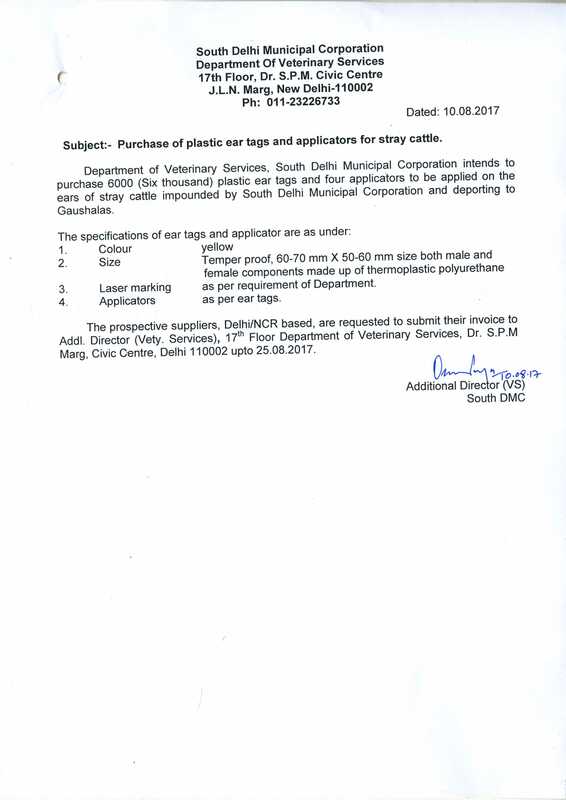 Purchase of plastic ear tags and applicators for stray cattle (Veterinary Department) Addendum-III of NIT No. F.120/E-in-C/SDMC/2017/13 dated 7.7.2017. Name of Work : Integrated Collection & Transportation of Municipal Solid Waste and Street Sweeping Waste in Najafgarh Zone Pre-bid reply of NIT No. F.120/E-in-C/SDMC/2017/13 dated 7.7.2017. Name of Work : Integrated Collection & Transportation of Municipal Solid Waste and Street Sweeping Waste in Najafgarh Zone Hiring of Consultant (System Analyst) in Information & Technology Department of South Delhi Municipal Corporation. 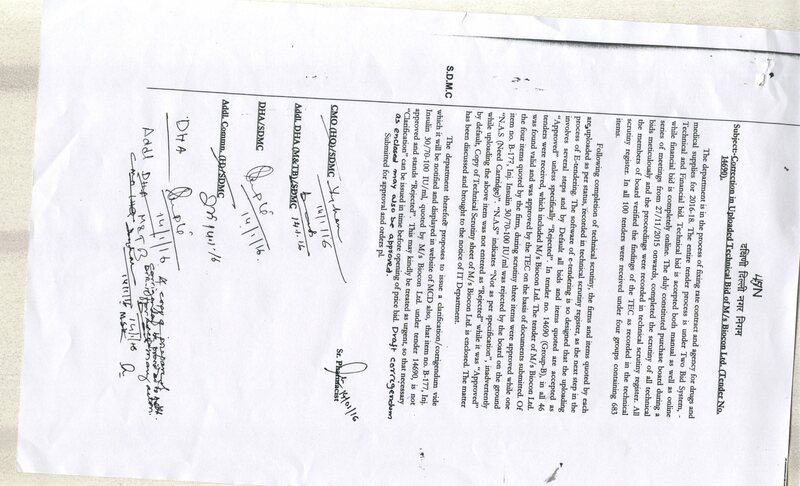 Circular - NON-INCLUSION OF PROVISION OF BANK GUARANTEE AT THE TIME OF SANCTION OF BUILDING PLANS. NIT No. 8 (2017-18) Short Notice Tender vide letter No. E.E. (E&M)-I/DEMS/2017-18/186 dated 1.9.2017 Name of Work: Supply, Installation, Testing and Commissioning of 25 nos. Pre-fabricated, fully assembled, trailer mounted, 10 seater Mobile Toilet Vans ... ADDENDUM-II. NIT No.F.120/E-in-C/SDMC/2017/13 dated 7.7.2017.Name of Work: Integrated Collection & Transportation of Municipal Solid Waste and Street Sweeping Waste in Najafgarh Zone ADDENDUM-I NIT No.F.120/E-in-C/SDMC/2017/13 dated 7.7.2017. SUB: Integrated Collection & Transportation of Municipal Solid Waste and Street Sweeping Waste in Najafgarh Zone. NIT No.F.120/E-in-C/SDMC/2017/13 dated 7.7.2017. Name of Work - Integrated Collection & Transportation of Municipal Solid Waste and Street Sweeping Waste in Najafgarh Zone. SK Data for South zone SK DATA Central Zone SK DATA Najafgarh Zone SK DATA West Zone SK data list of NGZ DBC Advance Program Corrigendum for instalation of RFID Project at entry points of Delhi Design, Build, Develop, Finance, Operate, Maintain and Transfer of the Integrated RFID Based Toll Management System at 13 (Thirteen) Road Entry Points [covering 65 (Sixty-Five) Toll Lanes] to the National Capital Territory of Delhi on DBFOT basis (RFP Ref No: D- 614/EEE/SZ/2016-17, dt 15.12.2016) Addendum No. 1 & Pre-bid replies Office order for collecting charges, taxes, fees etc. from 12.11.2016 to 14.11.2016. Supply & Installation of Machineries /Equipment's for Setting up of Technical Laboratory for Engineering Department at R.K. Puram MOU between SDMC and City of Ottawa, Canada Conferment of Ownership Rights to the License Fee based shops / properties transferred from L&DO and Directorate of Estates, Govt. 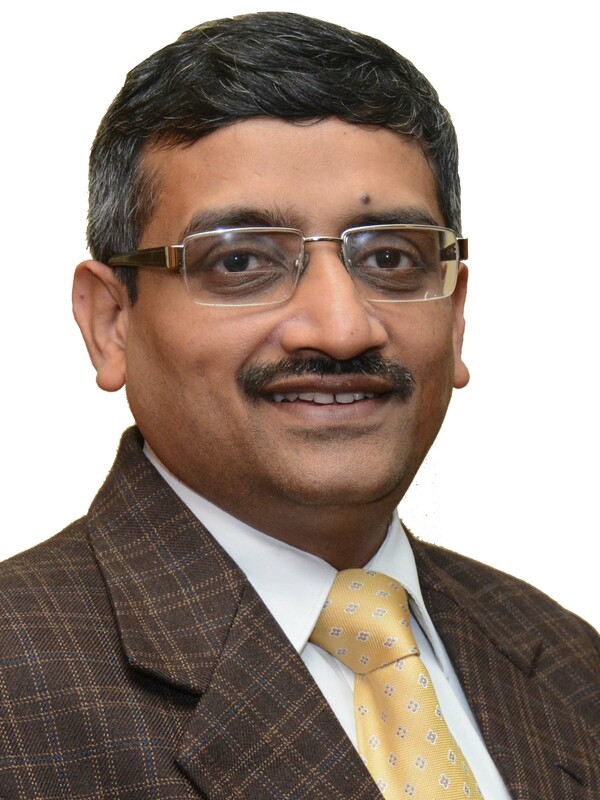 of India to SDMC (erstwhile MCD) Engaging consultant for preparation of Traffic Circulation Plan at M-Block Market, G.K-I, Central Zone Purchase of Dental Chair, Unit, Dental X-ray, Dental Instruments etc. by Health Department of SDMC vide Tender No. 14905 Offer of Trade discount on Local Purchase of Ayurvedic Medicines (Patent/Classical) Supply & Installation of Machineries /Equipment's for Setting up of Technical Laboratory for Engineering Department at R.K. Puram, South Delhi Municipal Corporation Corrigendum regarding Item no. B-177, Inj. Insulin 30/70-100 IU/ml, quoted by M/s Biocon Ltd. under tender 14690, stands - Rejected SDMC Commissioner's Budget Speech 2015-16 E-Auction for Mobile Towers in SDMC Rate Contract and Agency for medical supplies for the year 2016-18 Rate Contract and Agency for Medical Supplies for the year 2016-18, Gr-A Use of recycled Construction & Demolition waste products in Delhi National Voter's Service Portal SUPPLY OF FURNTIURE SDMC, Civic Centre, DELHI(Short Notice) MOU Signed between ITI LTD & SDMC for e-Auction service NIT (Short Notice) Supply of Furniture at SDMC, Civic Center, Delhi Contact Details for Complain of any kind of Burning Material. Pre bid query reply of G.K. - II Staff quarter Consultancy work Action Plan 2015 of Desilting of drain in SDMC National Electoral Rolls Purification and Authentication Programame by Election Commission of India Consultancy for construction of club type-V & type-VI quarters and Commissioner's residence at Greater Kailash part-II in South Zone. Guidelines for Auctioning of Stray Animals list of Urinals & CTC on the website of SDMC Corrigendum for zero waste management project REGULARISATION OF FARM HOUSE POLICY DT.26.02.2014 & CORRIGENDUM The policy for licence to Horses/mare & Horse Buggies Memorandum for provision of DG Sets at AC Community Halls in SDMC Please Check the Schedule of Taxes for Property Tax for the Financial Year 2013-14 in News & Events ***Submission of Online RTI Application has been suspended due to updation of software*** Solicit your help to make Delhi mosquito free. Keep your work place hygienic & free of Stagnant water. Interview of Staff Nurses and other Paramedical Staff in SDN Hospital has been suspended Property Tax Cheques/DDs/POs must in favour of "Commissioner, South Delhi Municipal Corporation" for properties falling under "South Delhi Municipal Corporation"
Corrigendum of NIT Tax/HQ/SDMC/NIT/2018-19/D-1970 dated 19.02.2019 in respect of Open Tender for "Selection of a Service Provider for Scanning, Data Entry, Data Synchronization and Digitization work for property Tax Department of south Delhi Municipal Corporation. 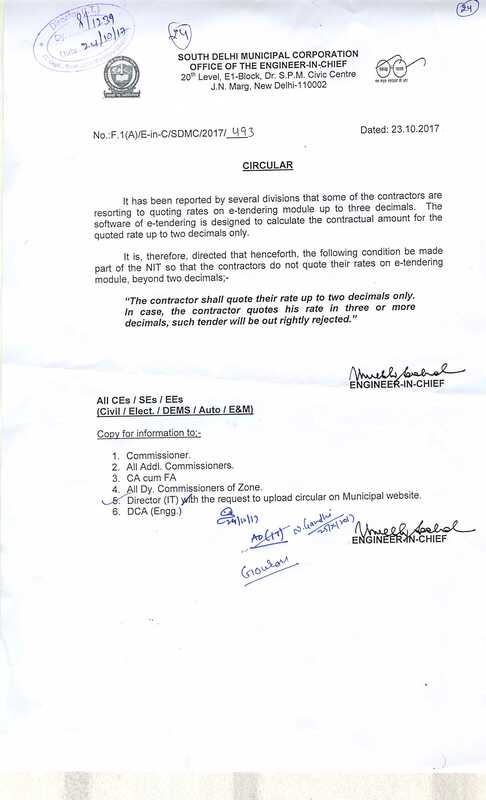 Corrigendum - OPEN TENDER FOR ALLOTMENT OF ADVERTISEMENT RIGHTS THROUGH DESIGNATED CLUSTER “SEVEN WONDERS PARK (WASTE TO WONDER PARK), SARAI KALE KHAN, CNZ” SITES UNDER THE JURISDICTION OF SDMC. RFP document for the work of Providing Consultancy Services for Development of Automated Multilevel Car Parking facility and Commercial Complex on PPP Model at Janakpuri C-Block Community centre (Janak Cinema Complex). RFP document for the work of "24/2 Consultancy Services for preparation of Detailed Project Report, Comprehensive Architectural, Structural Design, Drawing & Engineering Consultancy for Automated Multi level Car Parking System at Chotti Sabzi Mandi, Janakpuri Opposite Gurudwara in Ward No.11-S in West Zone." RFP document for the work of "24/3 Consultancy Services for preparation of Detailed Project Report, Comprehensive Architectural, Structural Design, Drawing & Engineering Consultancy for Automated Multi level Car Parking System at Commercial Centre B-1, Janakpuri in Ward No.11-S in West Zone"
Regarding Extension for submission of Bid in respect of RFID Project (NIT No. ADC/TT/HQ/2017/D-594 dated 08.11.2017). Engagement of Consultant (Transport) in Engineering Department of South Delhi Municipal Corporation. 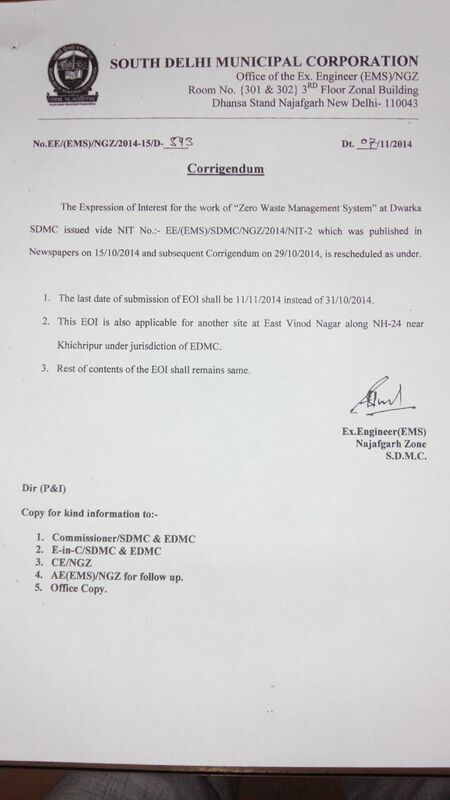 Addendum-III for the work of "Integrated Collection & Transportation of Municipal Solid Waste, Street Sweeping Waste and Drain Silt in NGZ of SDMC" issue vide NIT No. F.120/E-in-C/SDMC/2017/35 dated 24.11.2017. Building a sustainable Delhi in all spheres will need participation and engagement of all stakeholders including the private sector and the civil society especially the poor and marginalized. It is our endeavour to bring the best of the Municipal Services at the doorstep of the citizens of Delhi and to serve with 24x7 and 360 degree approach. Municipal Corporation of Delhi, the second largest civic body was trifurcated in the 2012 into South Delhi Municipal Corporation (SDMC), North Delhi Municipal Corporation(NDMC) and East Delhi Municipal Corporation(EDMC). SDMC is serving the population of almost 56 Lacs citizen with a responsibility of monitoring, upgrading and developing civic amenities efficiently with a view to create a better tomorrow for citizens of Delhi. It occupies an area of 656.91 Sq. K.M. which is further sub- divided into 4 Zones- Central, South, West and Najafgarh Zone and has 104 wards. SDMC also has unique distinction of providing civic services from highly posh residential and commercial areas to rural and urban villages, JJ Resettlement Colonies, regularized and unauthorized colonies. There are 388 Approved Colonies, 86 Rural villages, 81 Urbanized villages, 111 Unauthorized colonies, 252 Unauthorized regularized colonies and 32 JJ Resettlement Colonies.